Here is this Mobilink has launched new mobile application for all its valued Smartphone subscribers of Pakistan. 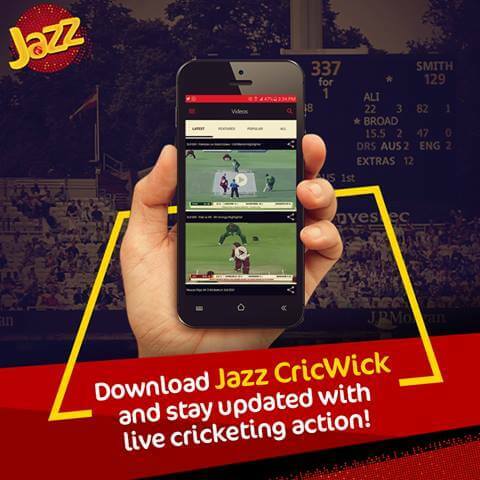 This time it has launched Mobilink Jazz Cricwick mobile application for all the cricket lovers who really need cricket updates on daily routines. This is first time in Pakistan there any telecommunication network has created this kind of mobile application for its valued customers. It gives multiple quality cricket updates in this mobile app and users can get all cricket news by using this mobile application. Cricket is one of most popular sport in Pakistan and there are many people really love to watch Cricket at any time. They also need to get updates and news on busy routine with correctly so this network has generated this mobile app for all these cricket lovers who really like for watching and getting updates of Cricket on regular basis. Subscribers just need to download this mobile APP and enjoy cricket updates, lives matches and highlights through Mobilink internet packages.This is mind-blowing service for all those people who really want to get update of cricket matches on busy time so they can easily get updates time by time through this Smartphone application in free of cost. The details of downloading process and features of this service are mentioned as below. Smartphone users can easily download this application from Google Play Store with correctly. Step 1: Users just need to visit Google play store. Step 2: Then search Jazz Cricwick on searching option. Step 3: After that users just need to install jazz cricwick and it will be downloaded into user’s Smartphone. Ball to Ball Live cricket matches updates. Videos packages of special moment. There are no charges for using this service. Customers just need to download this mobile application and enjoy this through Jazz internet bundles. This service is only available for Smartphone users. It gives all kind of updates of international cricket. This network keeps rights to DE-activate this mobile application service at any specific time. This has rights to remove any feature of this application at any time without being informed of its users.